Entries can be made online from this site or in person at the Apple Shack. Each entrant must enter separately. In other words only one person per entry. This allows us to create your own unique entry number. Junior is 12 years and under. On the day there will be lots to do while you wait for the judging and plenty to eat. music, Jumping Castles, wood fired pizza, cider, coffee and apple pie! If you are able to make a visit to the DARKES Apple Shack at Glenbernie Orchard, prior to the competition day, as a bona-fide entrant, you may collect a complimentary 2kg pack of cooking apples and 2 x disposable pie pans. You can use these for practice cooking prior to the day or for your bake-off entry. It's up to you. Simply show us your receipt or your confirmation email on your smartphone to receive your complimentary apples. If you live too far from us to visit and pick up the complimentary pack of apples prior to the bake-off, you will need to use your own sourced from elsewhere, as unfortunately, we can’t send you free apples and pie dishes. Bring 2 BAKED, IDENTICAL APPLE PIES (family size not single serve, and we recommend in disposable pie pans as we cannot guarantee the return of the pie pans) to the DARKES Apple Shack at Glenbernie Orchard from 8:30 a.m. and before 9:30 am on Sunday, 20 August, 2017. A trophy will be awarded to the top three scoring pies in each division (Open Male, Open Female, Junior Male, Junior Female and Open Apple Crumble). A perpetual trophy for each division will reside at the DARKES Apple Shack bearing the top three scorers names. Results will be published in the local newspapers including the 2508 Mag and 2515 Mag, and various social media. Apple pies must be double crust. In other words the pie must be predominantly apple and will have a crust top and bottom. At check-in, pies will be randomly assigned a number, and judges will not know the identity of the entrant. Judging begins at 9.30am with awards immediately following judging, around 12pm. Judged apple pies will be sold to the public after judging, and proceeds will go to the Stanwell Park Country Women’s Association (CWA). Winning pies will be Auctioned. The Contest is open to anyone wishing to bake an APPLE PIE. Official DARKES Apple Pie Bake Off judge’s ruling as to eligibility will be final. Pies MUST be checked in by 9:30 am on contest day (20/08/16). Late entries not accepted. Other fruits may be added but remember this is an apple pie competition so apple must be predominant and the addition of other fruits should enhance the apple not take over. Pies that need special handling, refrigeration or heating elements are not allowed. The finished pie cannot contain raw/uncooked eggs (white or yokes). We recommend that pies are baked in disposable pie pans only, as we can’t guarantee the return of your pie pan. 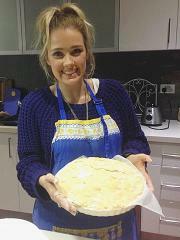 Pies will be scored on appearance, crust, filling and texture and overall flavour/taste. The top three scorers in each division (Open and Junior) will receive a trophy to keep and have their name etched on a perpetual trophy that will hang in the DARKES Apple Shack at Glenbernie Orchard. 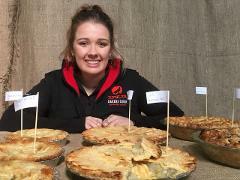 All pies will be sold after judging to raise money for the Stanwell Park CWA. 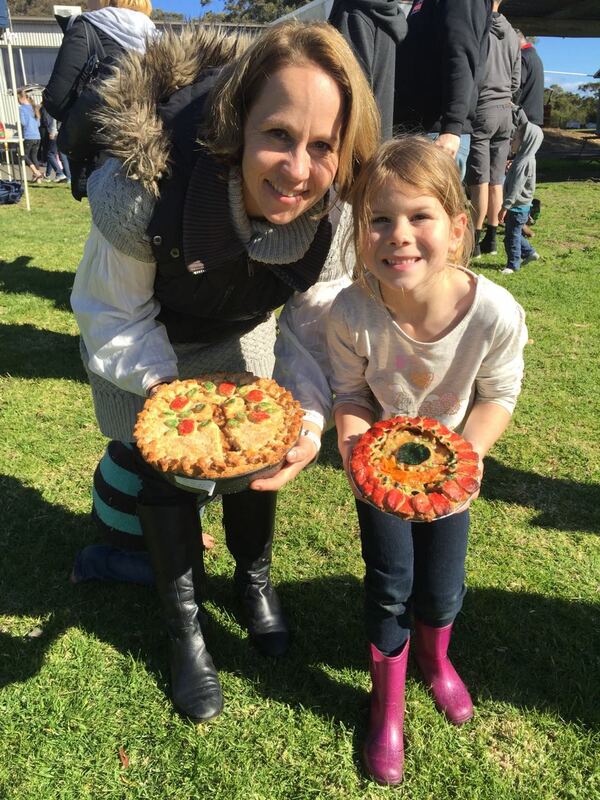 If you wish to bake a pie and not have it judged we will be happy to accept it and sell it by the slice to raise money for the Stanwell Park Country Women’s Association (CWA). At check-in, pies will be randomly assigned a number, and judges will not know the identity of the entrant. Pies should be family sized not single serve and it is recommended that they are baked in disposable pie pans only, as we can’t guarantee the return of your pie pan. To what extent does the whole pie entice you to want to try it? Is the decoration creative and appetising? A single slice unveils the looks and consistency of the filling and crust. Pies should have generous, well distributed fruit as well as good colour and definition appropriate to variety used. Nice aroma, pleasant, uniform flavours. All ingredients taste fresh and are well balanced. A complimentary use of spices and seasonings that are not overpowering. 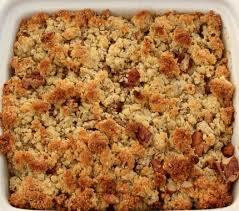 Generally, crust has a pleasant, mild flavour that complements the filling. However, in some specialty pies, the crust may be used to help create flavour accents. Pastry crusts should be flaky and delicate, but not fall apart too easily. They should melt in your mouth with a mild, pleasant taste that complements the filling. They should be a light golden colour, baked throughout and an even thickness across the side and bottom. The crimp should seal thoroughly all the way around the pie. Consider the memorable quality of the pie, are you impressed? This is the judges’ final chance to rate the pie overall. Flaky, melt in your mouth consistency that has a mild, pleasant flavour and is baked evenly throughout to a light golden colour. Gluten free versions will be taken into consideration and may vary from gluten flour crust versions. The crust should have a tight seal around the edges. Smooth uniform components with pleasant aroma and flavour which matches the advertised flavour. Appealing colour, and a nice aftertaste. Final fruit consistency will reflect variety used and cooking method. Even distribution and firm, but not overly crisp texture for varieties that hold their shape. Yes, all nuts are allowed, but if used it must be clearly stated at check-in on the bake-off day, and marked with the pie. How about bacon? Or cheese? But No meat pies here, folks! That being said, the simpler pies tend to be the winners. Apple should be predominant. Is this an apple pie eating contest? No, it’s an apple pie baking contest that anyone can enter. However, if you want to eat apple pie, we need you to! After the judging, all of the homemade pies are available for sale, either in slices or whole. We just won’t keep track of how much you eat or how fast, which is a good thing. Where do we go to drop in our pie? Come in to the DARKES Apple Shack between 9:30-10:30 a.m on the 24th of July. We will point you in the right direction from there! Should the pie be brought at room temperature or warm? This is entirely up to you. But please know that, in the past, in other competitions we know of around the world some winners brought their pies in hot, and others made their pies the day before. So we don’t think that the temperature of the pie upon arrival matters much in determining who the winners are! What’s the earliest we can drop our pie in? Pie check-in opens at 8:30 am. All pies MUST be received by 9:30 am. Please remember DO NOT BE LATE we won’t accept your pie for judging after check in has been closed! Really. Will you REALLY turn my pie away if I’m late? Yes! We hate to do it, but rules are rules! And it is only fair that all contestants have the same time restrictions. So, allow yourself plenty of time for baking & parking. Can I bake my pies in non-disposable pans if I’m all OK with not getting the pans back? Yes, if you don’t mind losing your pan, you are welcome to bake the pie in a different kind of pan. But, based on feedback from other competitions around the world, some winners have been in disposable pans, some not, so we do not believe it impacts the outcome of the contest. Why do we need to pay an entry fee? Our goal is to fundraise for the Stanwell Park Country Women’s Association. Profits from the entry fees and pie sales on the day will go to the CWA. This will be a great day and fun way to support a great Australian volunteer organisation. Thanks so much for helping us out! Why do we need to bake 2 pies? Because there may be multiple rounds of judging, we need 2 pies from each contestant so that the appearance of the whole pie can be judged in each round. Your appearance pie will remain uncut as long as you are still a contender to win! Pies should be family size, not single serve. Yes! The DARKES Apple Pie Bake Off is for all ages! Children 12 yrs and under can enter the Junior Bake-Off Section. For the safety of all participants, house pets are not allowed. Sorry folks! What if I need to cancel and not participate in the contest? If your plans have changed and for some reason you won’t be able to attend, let us know so that we can allow others to register! Unfortunately, we will not be able to return your entry fee, but at least it goes towards raising funds for the Stanwell Park Country Women’s Association – a great cause!